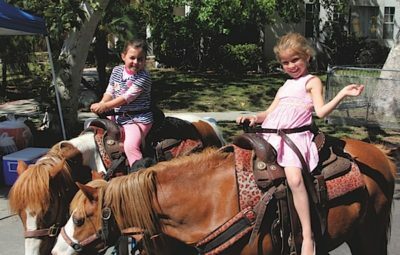 BROOKSIDE 2017 block party pony riders included Pearl Rudnick and Nikka Gueler. Brookside residents were set to gather on June 25 on the 800 block of Muirfield Road to enjoy their 38th annual summer block party. The event was to include a barbecue, a bounce house, face painting, pie-eating contests and a live auction featuring items such as passes to the Magic Castle. The party was sponsored by residents of Brookside as well as BMW, Trejo’s Tacos, CIM Group, and Salt and Straw.